So it began with a dozen yellow roses -- the most perfect ones I'd ever seen. 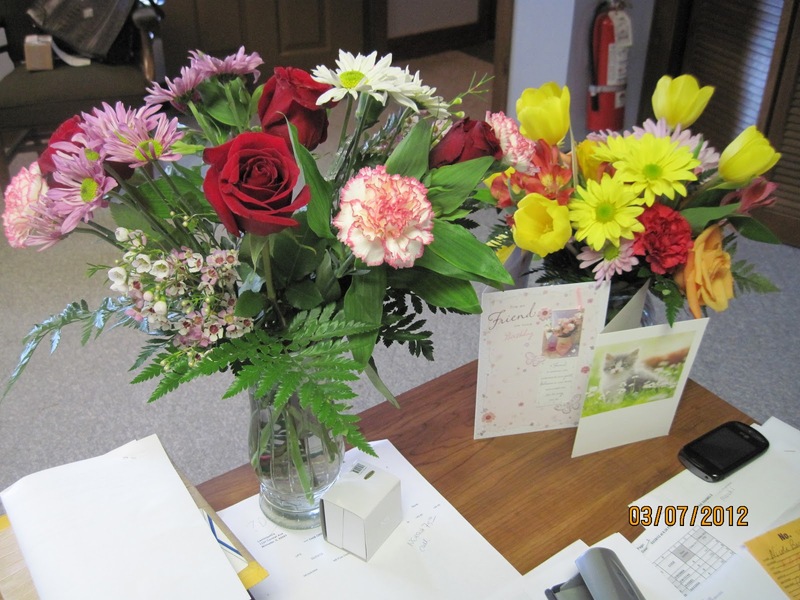 Then it continued at the office with another bouquet delivered this afternoon with no name --so I can't say thank you. 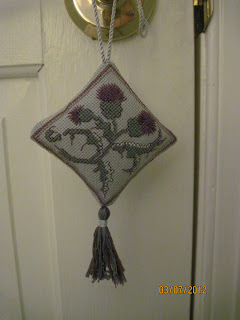 I love all things Scottish Thistle -- this is the first finish and I already know I need to improve that tassel! But it's hanging on my bedroom door and I love it. 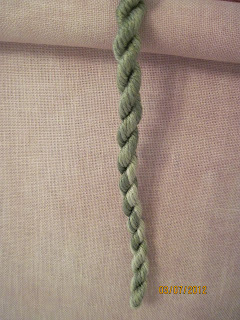 Next is a skein of Thread Gatherer's Silk n Colors in Willow (or Whisper?!). 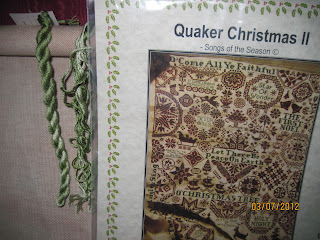 The color I've chosen to do my next special project Quaker Christmas II. 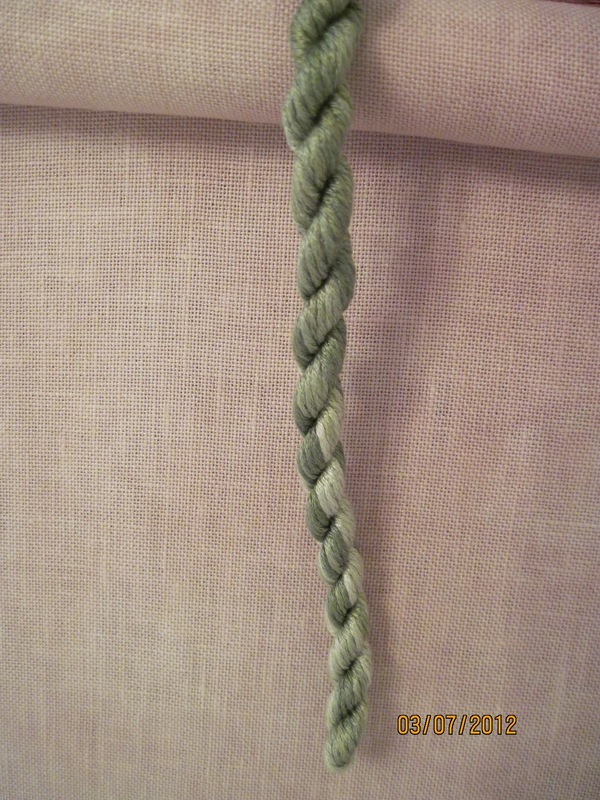 As this will hang on my wall year round I wanted to use a color I could really live with. For the song titles I've yet to choose a coordinating solid green --but that won't stop me from starting this tonight --my birthday gift to me! This next one is another fun one by Belinda at Blue Ribbon Designs "Hands to Work Hearts to God" for the top of a Shaker box. I've had this box for a year and have waited for just the right thing. The minute I saw this new pattern from Belinda I had to order it. 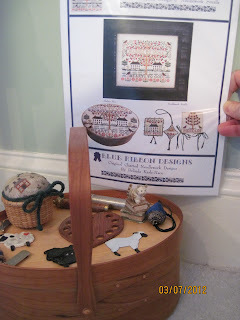 I have vacation in June and that's when, on my drive to Minnesota to see family, I've penciled in some cross stitch stores so I can stop and buy the materials I need for this. It's SO perfectly what I was wanting. Belinda must have been doing a mind probe on me --and that's no small feat! Many thanks Belinda. So that's it for the moment. And as I say often when I post (not-often!) I read your comments, follow your blogs, and so appreciate being connected with other women who are captivated by this same creative obsession. Happy stitching all. Happy Birthday Peg! Many more happy days ahead. Michele, thank you for the birthday wishes --it was pretty wonderful! Happy birthday Peg! I hope you continue to enjoy your very special day. I look forward to watching your progress on those new pieces. I have QCII started as well...maybe you will inspire me to get moving on that one! Wishing you a most windfall birthday! Beautiful flowers and wonderful projects you have chosen to do! Happy happy birthday! I will be joining you in August. Love the wips. Happy Birthday Peg~~ I hope it was a nice one!!! Happy birthday! 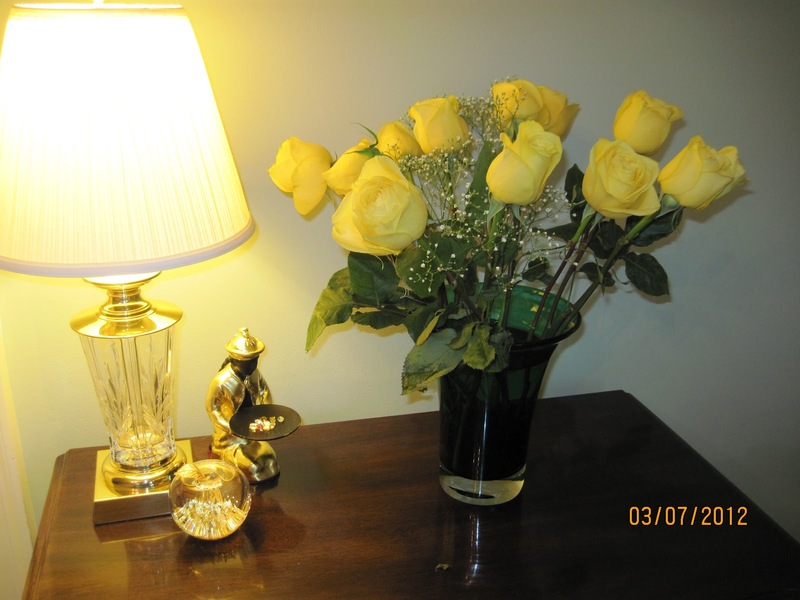 Looks like your are having a great one.... roses are beautiful! happy stitching on your new project! Happy Birthday! The flowers are so pretty! Love the thistle door hanger and the new projects! Happy Happy Birthday! Love the flowers!! You are going to be quite busy with your new projects!! I know they will be beautiful finishes! Hugs! The flowers you got are beautiful!!! Have lots of fun with your new projects! Happy birthday! 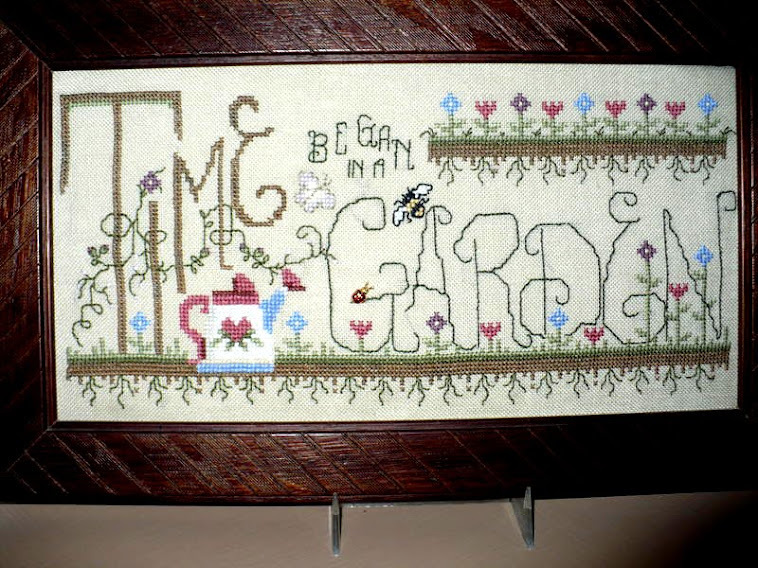 Beautiful flowers and beautiful stitching! Happy Birthday, Peg. Those flowers are beautiful! Cute finishing. I think Christmas Quaker II would look great stitched in green. Happy birthday. You have some lovely flowers. Sounds like your BD turned out to be such a nice day! I can't wait to see the progress on your new projects! Just wanted you to know that I have nominated you for the Liebster Blog Award! You have such an interesting and enjoyable blog that I thought you deserved this award!